Designed to be fully future proof. Future-proof your e4 Blockhouse by building it in two stages. 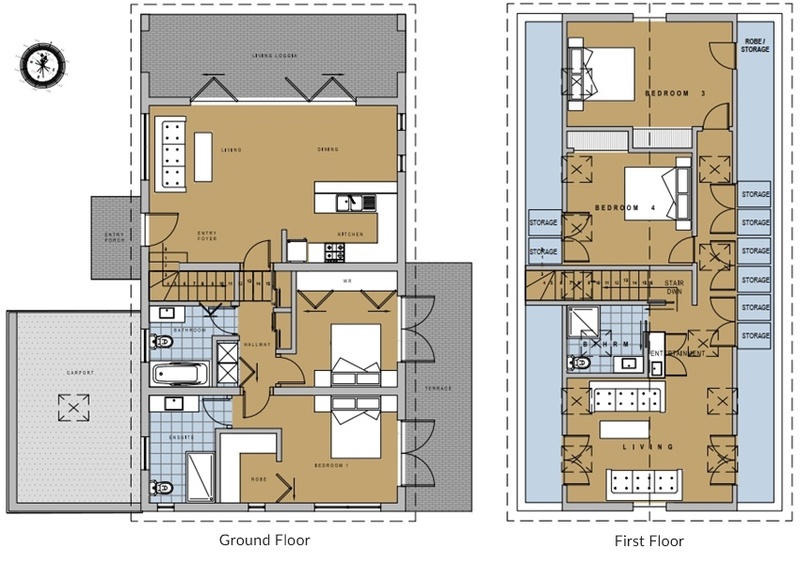 > Build the superstructure of 106m2 (Stage One) to include 3 bed/1 bath or 2 bed/1 bath or study – you choose! Carport or garage optional. > Make allowance for upstairs – pre-plumb and pre-wire. THEN – when you can afford it, line and finish the upstairs for minimal cost and increase your floor area by another 108m2. 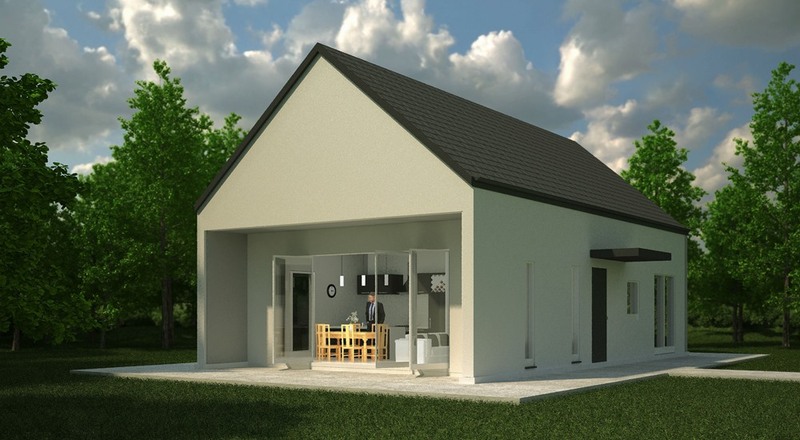 > When you are ready – you can double the size of your house for minimal cost because you already have the superstructure good to go! > Add dormers and gable end windows and highlights in the upstairs bedrooms, study and new living/lounge. > In the meantime, you have access to upstairs for storage with pull-down stairs. > No disruption to your living, no structural changes to cost the earth, minor consent requirements – easy! > Perfect to manage your mortgage and growing family! Perfect for Passive Solar Design. Plenty of bi-fold openings – just the way Kiwis love to live! 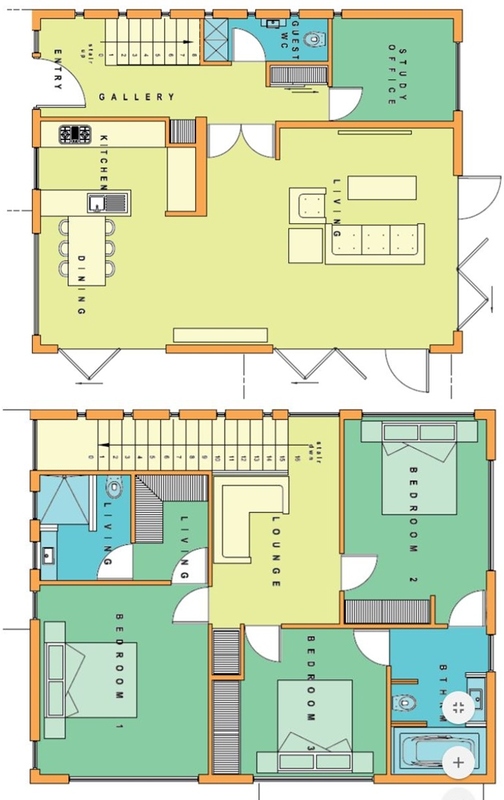 > Three bedrooms plus study and downstairs powder room. Upstairs three bedrooms, two bathrooms, robe. Lounge. 160m2, 80m2 footprint. > Simple structure – add a carport or garage. > Extend the roofline to create an upstairs balcony across the bedrooms as well as a loggia downstairs. > Integrate your kitchen bench/dining table. > This house can go up to 3 levels if you prefer a pitch, not flat roof – a clever use of space on a 80m2 footprint. > Add a roof for the 3rd level as in the e4 2-level and increase your floor space to a total of 240m2 into the existing superstructure. > Staircase storage – great living spaces. > Speak to us about designing these spaces for you and your family.